15Five is the #1 performance management software out of 150 vendors on G2Crowd. 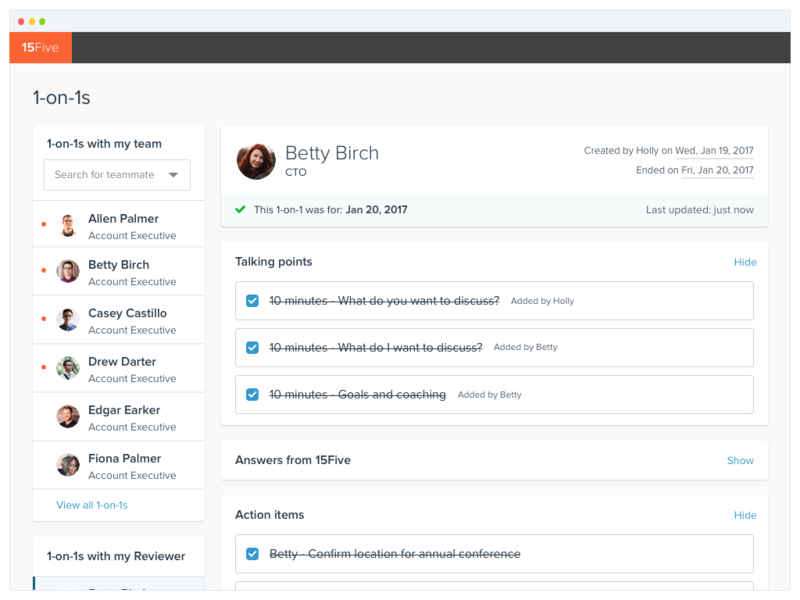 It's lightweight performance management software helps managers check-in with employees every week via a short survey and automated 1-on-1 meeting agendas. 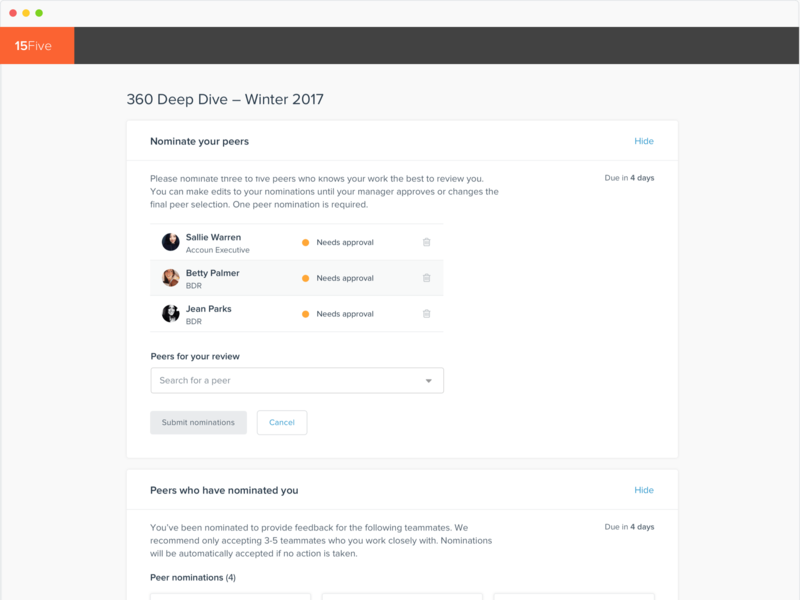 Managers who use 15Five also can easily setup and track quarterly objectives (OKRs) for their teams and individual employees, give recognition with High Fives, and help employees grow with quarterly or semi-annual 360° Best-Self Reviews. The 15Five weekly check-in replaces long reports, email threads and spreadsheets. Employees spend 15 minutes a week to answer questions and update the status of their OKRs, and managers just 5 minutes to review and quickly add responses to a 1-on-1 agenda. 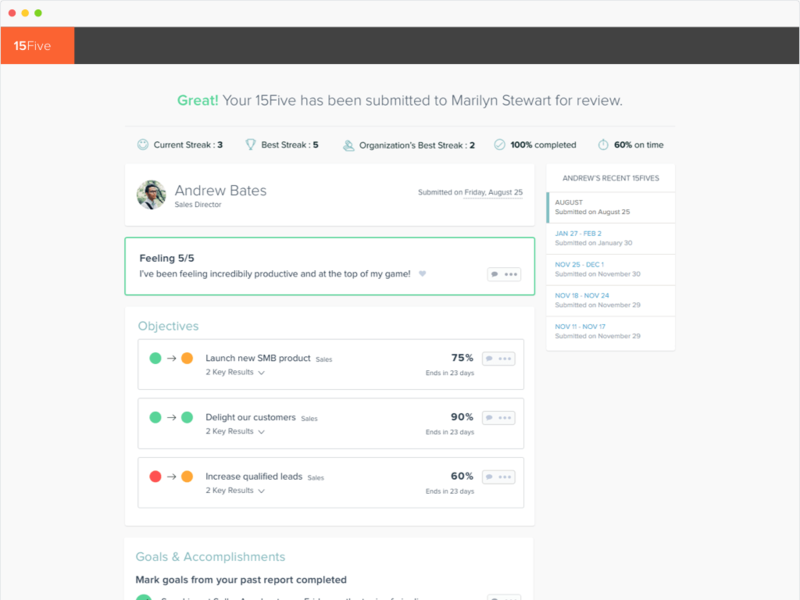 15Five allows managers to turn employee feedback into swift action, coach employees through their most pressing challenges, and gives leadership a sense of morale and how the company is tracking toward their goals. 15Five Objectives (OKRs) allows you to easily create, manage and track objectives. The process of tracking OKRs inside 15Five won't disrupt your employee's workflow or add extra spreadsheets and emails to update. Everyone will stay focused and engaged on the highest leverage activities that support your company-wide goals. Our answer to the counter-productive annual review is the Best-Self Review. Simple, lightweight and research-backed, the Best-Self Review is a 360° performance review that incorporates self, manager, peer and upward feedback, and designed to occur either quarterly or semi-annually. 15Five helps organizations celebrate the big and little wins. Employees can simply and quickly @mention a colleague and share why that person earned their praise over the past week. 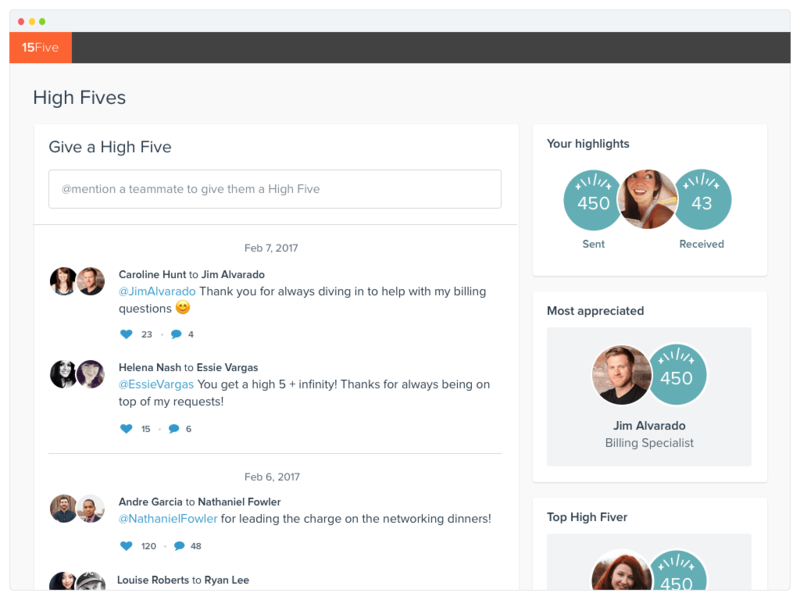 All High Fives can be displayed to the entire company in 15Five or via Slack, boosting morale and allowing managers to easily pinpoint their rockstars. The BambooHR and 15Five integration links a company’s performance management software with their human resource information software (HRIS). In a few simple steps inside the 15Five application, an administrative user can link the two accounts and import the company’s employees and management structure into 15Five. The synced fields you can import include: name, title, email, employee ID, location, reviewer email, and group (department in BambooHR). The user can customize the sync schedule to run automatically or manually, so that the two systems are updated with the latest employment changes. Status Status 15Five will check for the "status" field. If it is left blank, employment status will be checked.